Zucchini on Zucchini. | Eat More Plants. 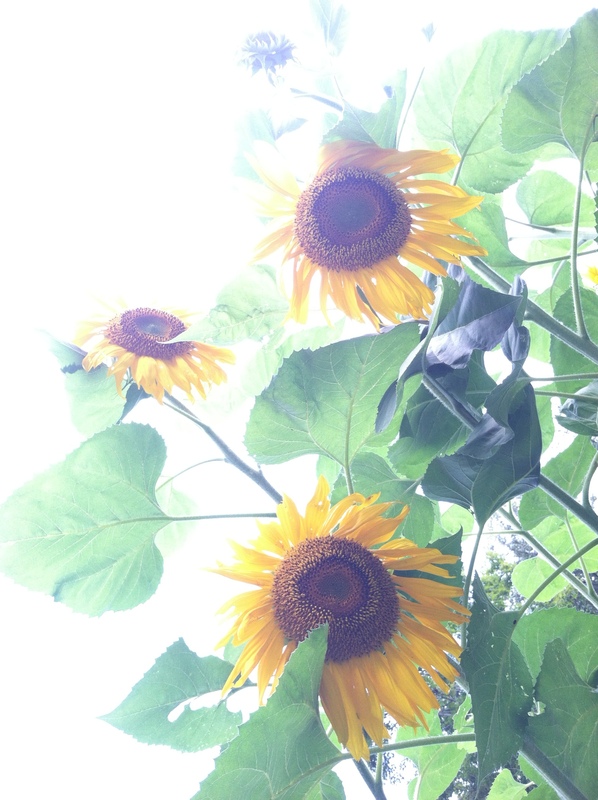 It’s amazing how you can set your watch (or calendar really) by the different sunflower blooms. These giant stripe sunflowers bloom the day before labor day every year. Like clockwork! I love it. Even though summer is coming to an end, I still have massive amounts of zucchini. I decided to make fritters, which are a favorite treat in my house, and also dip the blossoms in the fritter batter and fry those as well. Fritter batters can be very versatile. The recipe I use is from a Martha Stewart magazine that I’ve had for eons…I use eggs for mine (most of the time) just because I collect about a dozen a day from my hens and I like to use them if I can. Squeeze some liquid out of the grated zucchini, using a paper towel or a clean dish towel. 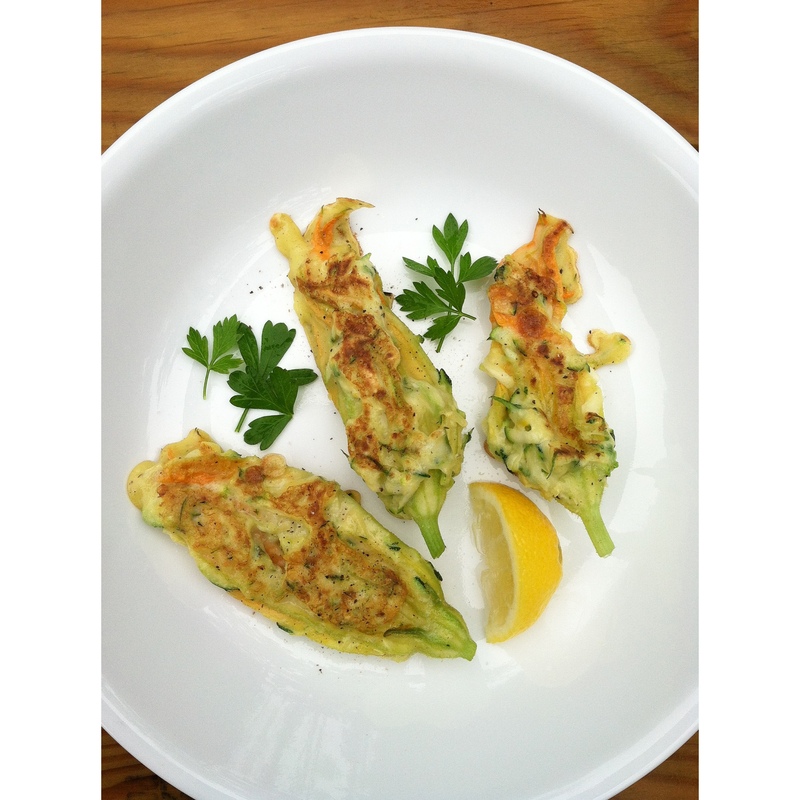 Mix zucchini with the eggs and oil. Add remaining ingredients except flour. Now add the flour a little at a time, so as not to create clumps. Add a few tablespoons of oil to the hot pan. Test the readiness of the pan by adding a tablespoon of batter and seeing if it immediately starts sizzling. Do not begin adding more until you see that the pan is up to temperature. Add about 3-4 tablespoons of batter at a time and let the bottom brown, about 3-4 minutes. Flip once sufficiently brown and lower heat a little. Cook for another 2-3 minutes. Remove from pan and place on paper towel lined plates to collect any excess oil. Sprinkle with salt and fresh cracked pepper, also lemon if desired. Add more oil to the pan as necessary while cooking each batch. If you’re going to try frying the blossoms dipped in batter, pour a little extra oil in the pan so the the blossoms cook all the way through and flip onto each side to brown evenly. Cook these a little longer than the fritters so you don’t end up with a mushy inside.